If you are interested in digital transformation and digital Innovation, this is the blog for you. SAP's vehicle for this transition, hailed as the next big thing in technology, is SAP Leonardo. 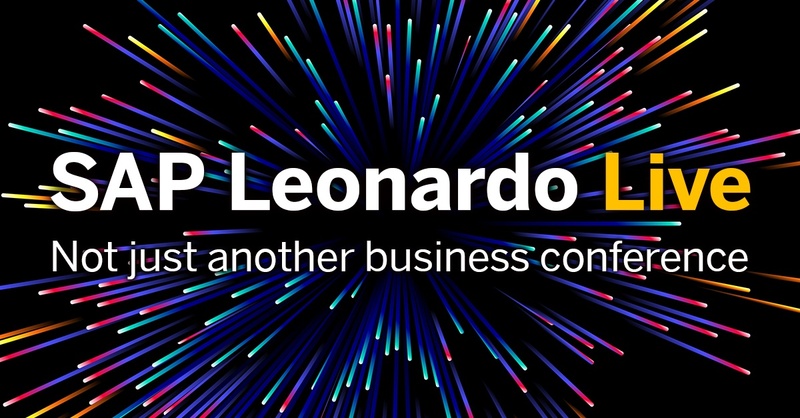 I recently attended SAP's first #LeonardoLive event in Frankfurt, Germany. SAP definitely left no stone unturned to make this event the talk of the town, and in fact the talk of social media. With high-tech customer case studies, demos and healthy participation from all areas of the SAP ecosystem, it was a trending topic on Twitter in Germany. So, let's explore the What, Where, How and When of SAP Leonardo. 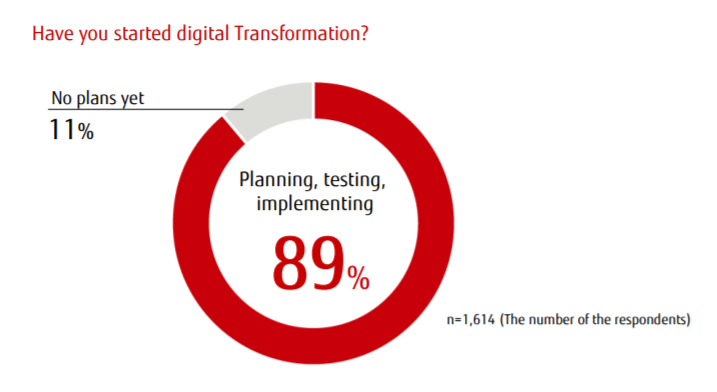 The majority of organisations consider the need for Digital Transformation as business critical. The definition of digital transformation has evolved. Today, it is about receiving, capturing, storing and processing data, and driving meaningful information from that data, to create insight leading to an outcome or action. This endeavour presents a series of challenges such as infrastructure, security, strategy and skill sets to name a few. Also, it cannot be addressed by any single technology. These technologies can run on top of an SAP infrastructure or those provided by other providers such as Google Cloud Platform, Microsoft Azure or Amazon Web Services. Today, finally, the ever-growing enterprise demands are complemented by maturing technical capabilities. From a technology perspective many niche technologies are simultaneously achieving maturity. This is combined with the cost of technology infrastructure like sensors and processing capabilities dropping significantly. Humongous data - With huge amounts of data points (IoT sensors) and blurring organisational data boundaries there's a tsunami of data reaching the digital core. This growing amount of data comes with signficant opportunity to extract insights and patterns, and identify new markets and new business models. Real time data flows from shop floor to board room for uninhibited transparency and establishing single source of truth. Diminishing product life-cycle - Within ten years of the first iPhone launch, 15 models have been released and six models (successful) discontinued! This is revolutionising manufacturing and supply chain. To understand why SAP Leonardo is uniquely placed as a key piece in the journey to digital excellence, let's have a look at its evolution. Like Steve Jobs famously said "… you connect dots looking backwards." 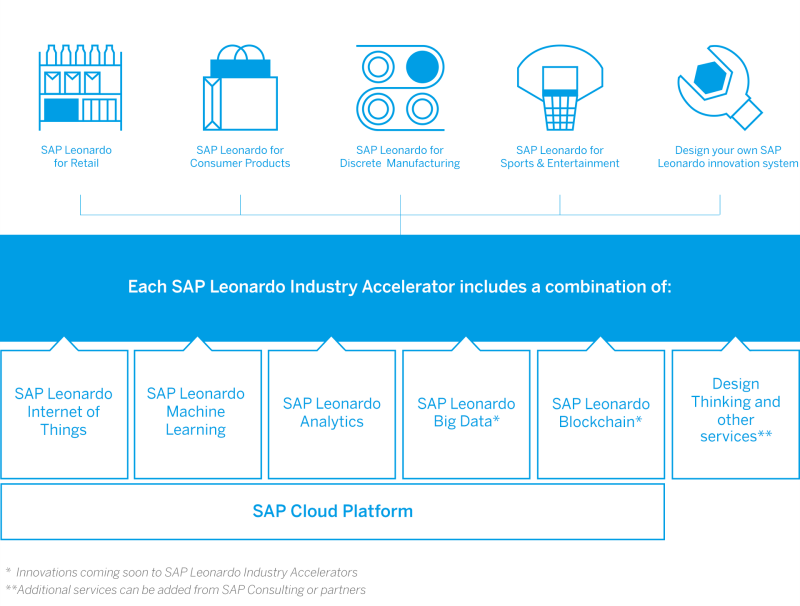 We can certainly connect the dots to see the journey of SAP Leonardo. A few years back SAP launched their new UX paradigm, Fiori, to give its users a simple, intuitive, consumer grade, role based user experience. Coupled with enabling data to travel from on-premise to cloud, Fiori provided the capability to bring anything and everything from the ERP with just the right look and feel. Today, the ERP data and functionality is accessible on your handheld devices. Further, the cloud offerings advanced into a plethora of services enabling users to manage their entire ERP landscape on cloud, in an on-demand fashion. Secure - security of organisational data is the most important; and lack of it can be a deal breaker. SAP Leonardo comes with end-to-end security for the scenarios. Open - integrates with your existing solutions. Modular - adapt/pick those technologies needed, and complement the pace of your Digital Transformation Plan. Scalable - the solutions can be scaled across domains and geographies in an incremental way. Seamless - capable of seamlessly integrating with your existing core ERP landscape, be it on-premise or cloud. The business case for harnessing data (existing and future) is too strong to ignore. Organisations realise that departments (data houses) can't live in silos - the whole is bigger than the sum of the parts. Digital business processes, new ideas for operational efficiencies and new business models are emerging - the idea of #SelfDisruption. But the question of 'Where to start' can be overwhelming. There are simply too many plates spinning to enable a quick answer. This needs to be thought through and strategised. Challenges of reskilling the workforce and managing infrastructure can be a nightmare for IT. This is where design thinking becomes crucial to any Digital Transformation initiative. Before focussing on improving the existing pieces of the puzzle, organisations/teams need to take a step back from the solution space and focus on identifying the right problems to fix. Before finding answers, business leaders will have to identify the right questions to ask. They will need to engage the right stakeholders who can define what kind of information is needed, at what time, and how that can be achieved. Proven technical expertise; and with the capability to evolve technically. Deep understanding of the functional processes of the domain. Design thinking in their organisational DNA and are capable of finding/devising solutions that fit customer use-case. There is no one size that fits all. The complexity of business processes, evolving business landscape and increasing technical complexities, makes “selecting the right partner” a critical factor. When can SAP customers realise the advantage of SAP Leonardo? How ready is Leonardo, and what is in the future? Some of the technologies of SAP Leonardo have been available for quite some time and they are ready to use. They have been demonstrated successfully as part of customer case studies and demos. Whilst we may still be on the first wave of technologies such as Machine Learning and Blockchain, other participating technologies enable capturing and processing of data. Machine Learning will enable data to be converted into insight but the scope and application of this is still relatively untapped. Blockchain is still be launched as a service or offering and both of these emerging technologies should get better with time. Personally, this is going to be an interesting space to watch. Augmented Reality and Virtual Reality appear to be the promising areas for connecting with the capabilities of SAP Leonardo and there are already interesting experiments/case studies being conducted in this area. 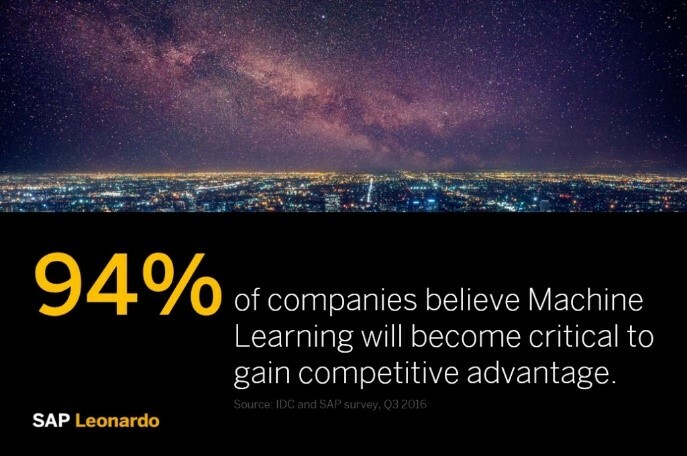 It is evident that SAP Leonardo could be a game changer. It can bring unprecedented advantages but it needs to be carefully planned. The question is not when is the right time, because it is really right now! The question is not whether technology is ready, because it is and SAP is eager to help customers. If you are committed to digital transformation, then the important questions are: Have you taken the right first steps? and Have you carefully planned and engaged with the right partner? 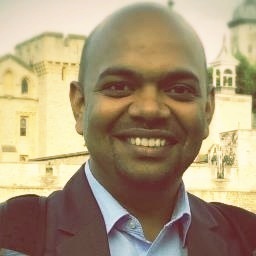 Utsav Chobe is a Senior Consultant at AgilityWorks. He began his career working as a Java Developer and developed an interest in the related fields of user experience and design thinking. He is passionate about landscapes with multiple systems and technologies, and keenly follows developments in SAP's strategy around SCP, Integration, User Experience, Design Thinking, SAP Leonardo and HANA. Outside of work, he is passionate about reading and listening to music.